Why these stocks broke away from indexes on Monday. As for individual stocks, Universal Display (NASDAQ:OLED) and KLX Inc. (NASDAQ:KLXI) made big moves on unusually high trading volumes. 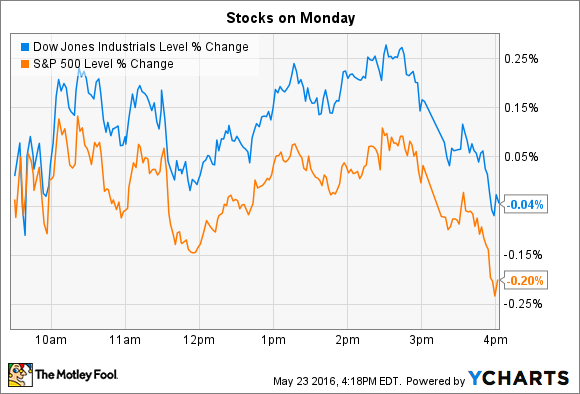 Here's why the two companies broke away from broader indexes on Monday. Universal Display's stock rose 9% and touched a new all-time high after receiving a head-turning upgrade from Goldman Sachs. Analyst Brian Lee boosted Goldman's price target to $76 per share from $55 per share due to his forecast of spiking demand for the company's organic LED (OLED) technology. Apple (NASDAQ:AAPL) is expected to use the high-end displays on its iPhones beginning next year and Lee believes that could power a "hockey-stick" style jump to over 100 million orders a year by 2018. It isn't exactly news that Apple's set to throw a ton of business to Universal Display. The materials giant's shareholders are also well aware of the buzz in the industry around its display technology. CEO Steve Abramson recently bragged to investors that "the OLED ecosystem is bustling with excitement and activity," as he listed several flagship smartphone and TV device launches that incorporate the high-end displays. Yet Lee's upgrade makes the case that Universal Display's stock could climb as investors get more details about Apple's product plans. That appears to be what's happening here: Reports from the supply chain suggest that Apple is asking producers to manufacture as many as 78 million new iPhone units for the next upgrade cycle, or about 10 million more units than Wall Street was targeting. In this case, what's good news for Apple is even better news for Universal Display. KLX Inc., which specializes in producing high-value parts for the aerospace and oil and gas industries, fell 15% after announcing surprisingly weak first-quarter results. Sales fell 15% mainly thanks to a 56% slump in its energy division. In a press release, CEO Amin Khoury cited an 80% drop in working oil rigs that's pushed dozens of oil and gas companies into bankruptcy. "Our business has been challenged by some of the most extreme market conditions in the history of the oilfield services industry," Khoury said. KLX's outlook isn't forecasting a quick turnaround, either. In the current quarter its aerospace business faces a tough comparison with a prior-year period that was boosted by military and business jet sales that don't appear set to repeat this year. Executives are projecting that things will begin to look better after that, with the third and fourth quarters helping produce slight growth in the division for the full year. The energy market is much harder to read. "It is impossible to confidently predict the beginning of any economic recovery in the oil and gas industry," Khoury said. In the meantime, KLX will focus on cutting costs as deeply as possible without compromising its energy sales capabilities.